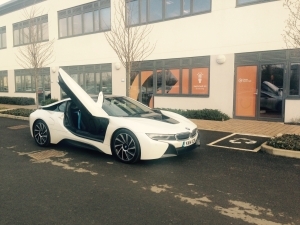 Electric Corby hosted the UK’s BMW i Team’s 2015 strategy meeting yesterday at the Corby Enterprise Centre. The meeting was a return to Corby for the Head of the BMW i Team, Carl Sanderson who managed the BMW Performance Centre when it was based at Rockingham. “I have always been impressed with appetite for change in Corby, reflected in new developments in the town and the activities of the new Electric Corby fascinated the team, so here we came. We are always looking for innovative, creative places to experience that are outside our norm and Corby is just that. Moreover, Electric Corby is just the type of innovative, creative initiative that we need to understand and hopefully both teams have learnt something from the day”. Norman Stronach, Corby Borough Council Chief Executive noted that, “It is important to keep Corby at the forefront and we are delighted to see BMW i with Electric Corby. This is another reason why we established the Community Interest Company to ensure Corby is seen as a centre for innovation and creativity”. Joe Dickinson, Electric Corby Co-Founder said “This is a great recognition for Electric Corby and the town. It shows how far we have come and gives us a fantastic opportunity to promote ourselves as well as learn from the most innovative car company in Europe, if not the world. We hope to be working with BMW i on at least one of several exciting projects we have in the pipeline”.